Local catering company Outside Catering Surrey takes all the stress out of providing great food for your guests. They even take care of the washing up! Have you got a wedding, christening, birthday party or other special occasion coming up?�Why not take the stress out of the catering side of things and a let a local catering company cook and organise it for you so you can relax and enjoy the event? Outside Catering Surrey�have a great selection menus on their website but they can cook pretty much anything you request too. From canapes to fork buffets to full five course a la carte meals - they can cater for everything. They also source their food locally. 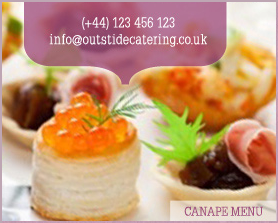 "For our meat supplies, we only buy the best quality," explain�Outside Catering Surrey. "That is why we use S.M. Pinegar in Cheam Village. They�are a family-run business just like ours. They provide excellent Scotch beef and other fine farm meats.�We have known the family for nearly thirty years; they are a great local family butcher." For the summer months, you could choose one of�Outside Catering Surrey's�excellent BBQs. Or for something really spectacular, you could try their hog roast which feeds around 100 people. "Our hog roasts are very popular," say�Outside Catering Surrey. "They really do give a wonderful flavour! Once the aroma drifts in your direction as you're drinking your Pimms and lemonade, it's very tempting to jump the queue and get yours first!" However, on top of all this, arguably the best reason to let�Outside Catering Surrey�organise your event is the fact that they can also take care the washing-up afterwards. Perfect! So if you like the idea of letting someone else do the worrying so you can enjoy your special day, why not give�Outside Catering Surrey�a call?